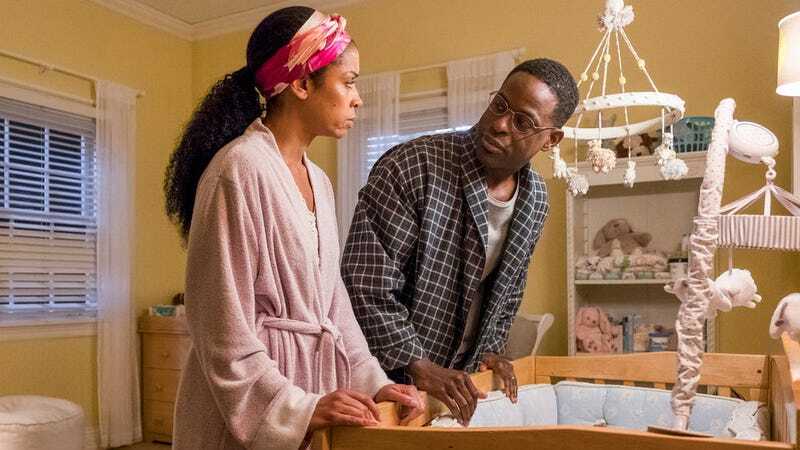 This Is Us has a habit of using poetic, overwritten monologues to clunkily explain the emotional realities of its characters. So when a sleep deprived Beth started philosophizing about nachos, I preemptively rolled my eyes. And then she hit upon maybe the most profound observation This Is Us has made in its three-season history: Randall is the kind of person who will thoughtfully make a loved one nachos and then unthinkingly eat all the best chips himself. It’s a metaphor that genuinely took my breath away in its pointed simplicity—not just as an observation about Randall, but also as a summary of all the Pearson men. And as with the relationship dynamics between Jack and Rebecca or Kevin and Sophie/Zoe, there’s a lot about Randall and Beth’s relationship that resonates with bigger societal ideas about marriage and gender dynamics too. This Is Us spent its first season building up Jack’s legacy to mythic status, only to spend the next two seasons complicating and subverting our perception of him (including in the big blowout Jack/Rebecca fight from the first season finale, which is glimpsed again in this episode). Now This Is Us is doing something similar with Randall, who seemed to be practically godlike in his infallibility for the first two seasons. I’m not sure this season’s clunky campaign storyline was worth it to get to this point, but this is easily the most interesting Randall and Beth have been all season. “R & B” is bookended by Randall and Beth’s big present-day fight, which stems from Randall’s cruel voicemail from last week. Beth’s assertion that they’ve been having the same fight for their entire relationship kicks off a journey through time from their first date to their unusual proposal, their wedding day, their early weeks with Tess, and the point in season one where both William and Kevin were staying at their house. All of the flashbacks are really engaging to watch—particularly the proposal and wedding ones—but I’m not sure they’re quite as revelatory as this episode wants them to be. Then again, maybe that’s kind of the point. This is an episode that’s far more interested in asking complicated questions than in providing easy answers. Last week, Sophie noted Kevin’s almost subconscious ability to manipulate people into giving him what he wants. This episode points out that Randall (at least as an adult) shares that same manipulative charisma—something they both inherited from Jack. Randall is, as teen Beth puts it, “a lot,” and he does have a tendency to consume everything around him and then use impassioned monologues to sweet talk everyone else into getting onboard. But Beth is in some ways complicit in that dynamic too. She claims she wants an equal partnership with Randall, but she’s the one who gets up in the middle of the night to micromanage him as he changes Tess’ diaper, rather than just letting him do it himself. It’s complicated, just as the dynamic between Jack and Rebecca is complicated. Besides the nacho philosophizing, the other moment in this episode that made me gasp was Beth asserting, “You have turned me into your mother.” This Is Us has compared Randall and Beth to Jack and Rebecca before, most memorably in “A Manny-Splendored Thing” (the episode where we first heard the story about how Kevin helped Randall ask Beth out for the first time). Back then, Randall claimed that he didn’t want an unequal partnership like the one he felt his parents had, but he’s kind of maybe ended up in one anyone. It turns out that even men and women with the best of intentions can fall into the age-old dynamic wherein the wife is the one who knows which kind of toilet paper their guests prefer and where the syrup aisle is. I actually wish this episode had spent more time digging into the similarities between Rebecca and Beth, especially because their brief mini-golf scene together is so great. It offers an origin story for their warm friendship in “The 20’s” and makes for a fascinating study in contrasts between two very different, yet also very similar women. I was ready for Rebecca to open up about her own experience being married to a pushy Pearson and to some extent giving up her dreams to build new ones with him. Instead the scene ends far too quickly. Hopefully it’s a relationship the show will dig into again. “R & B” isn’t all heavy drama. From their sweet nacho-centric proposal to the really lovely montage of the two of them crafting and reciting their vows (impressive on-the-fly memorizing skills! ), “R & B” makes an effective case for why Randall and Beth are so great together too. They bring out the best in each other when they work as a team. But the downside of defining yourself as part of a team is that you can lose your independent identity in the process. That hasn’t really happened to Randall, but it has happened to Beth—which feels like a meta commentary on the fact that Randall was introduced as a protagonist of this series and Beth was introduced as a supporting player in his story. The weakest thing about “R & B” is its ending. Though it’s undoubtedly a cruel comment, I’m not sure I buy that Beth’s snipe about Randall’s anxiety is quite the crossing-the-line moment this episode frames it as—especially considering their whole fight began because of an incredibly cruel statement that Randall made with far less provocation. Also, of all the flawed behavior people exhibit in this episode, the decision I found the most petulant and ridiculous was Randall driving all the way back to Philly to sleep in his office, rather than just sleeping in another room in their giant house. That needless self-flagellation felt far more manipulative than any of the big speeches Randall delivers in this episode, but it wasn’t really presented that way. Instead, it felt more like the writers just forgot that Philly is a full hour away from Randall and Beth’s house? It doesn’t undermine the whole episode, and I appreciate the boldness of leaving the Randall/Beth conflict unresolved rather than wrapping it up in a neat bow as the show so often does. Yet that odd detail feels like another example of the This Is Us writers not fully considering the logistics of an argument that’s theoretically based on nitty gritty logistics. “R & B” isn’t a perfect hour of TV, but it’s one that raises a lot of interesting questions and definitely leaves me wanting more. In particular, I’m very curious to see how young Randall and Beth went from their terrible first date to a loving relationship, which will hopefully provide fodder for plenty of future college-set flashbacks. Of course, the biggest question of all isn’t about Randall and Beth’s past, it’s about their future. It was so lovely to see William again! I enjoyed seeing the origin of the “Worst Case Scenario” game Randall and Beth previously played in the season two finale. Beth mentions the apartment building that she and Randall bought together, which reminds me—do they still own that? Is running it a part of their lives? Is it bringing in money for them? 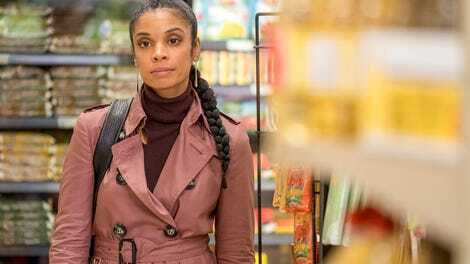 That bob-length hair looked super cute on Susan Kelechi Watson.